A leaking fuel pipeline triggered a massive blaze in central Mexico. 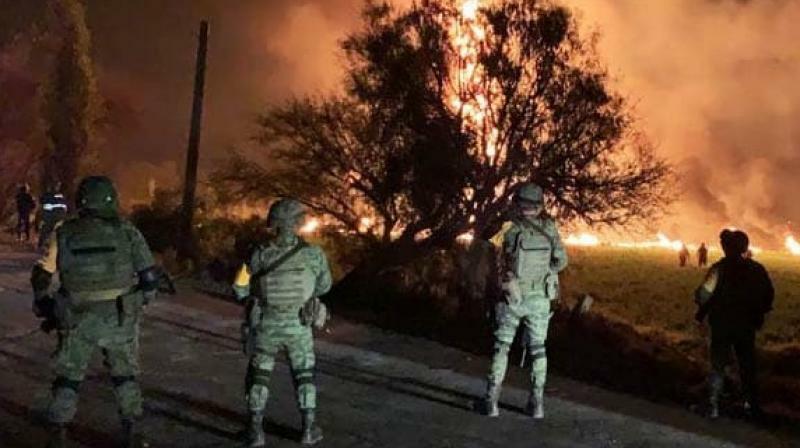 Mexico City, Mexico: A leaking fuel pipeline triggered a massive blaze in central Mexico Saturday, killing at least 20 people and injuring another 54, officials said. "I've been told that 20 have been burned to death and another 54 burn victims being treated" in hospitals, Fayad told local FaroTV, with the blaze still raging. Scores of locals were collecting fuel in buckets and cans from spouting leaks, and making off with the stolen gasoline, local media showed. Federal and state firefighters and ambulances run by state oil giant Pemex were headed to the area to help burn victims, the governor added. The tragedy comes just as anti-corruption crusader President Andres Manuel Lopez Obrador presses implementation of his national fuel theft prevention plan. But the government's strategy to fight the problem has led to severe gasoline and diesel shortages across much of the country, including Mexico City, forcing people to queue for hours -- sometimes days -- to fuel up their vehicles. Lopez Obrador's government has shut off key pipelines until they can be fully secured and deployed the army to guard Pemex production facilities. In addition, Mexico City residents woke up to a second week of fuel shortages Monday, though lines at service stations appeared shorter than the previous week. Lopez Obrador so far retains broad support: 89 percent of Mexicans back his crackdown on fuel theft, and his approval rating has even ticked up slightly, to 76 percent, according to a poll published Monday by newspaper El Financiero.